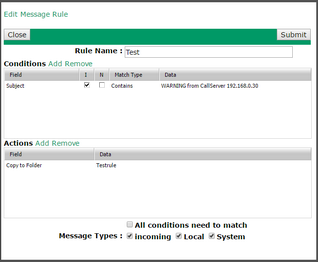 The user's Message Rules tab lets you define rules for what happens when messages arrive in this user's Inbox folder (VPOP3 Enterprise only). VPOP3 processes Message Rules from top to bottom in the list and a rule can indicate that VPOP3 should stop processing after that rule. You can reorder the rules using the Move Rule Up and Move Rule Down buttons at the bottom of this page. To add a Message Rule, press the Add Rule button. To edit a rule, either select it and press the Edit Rule button or simply double-click a rule in the list. The Rule Name is simply a name to help you find it in the future. If the All conditions need to match box is checked, then all the specified Conditions need to match for the rule to be triggered. If it is not checked, then any one of the conditions is sufficient to make the rule be triggered. If you have more complicated needs than that, you can have rules check if previous rules matched. 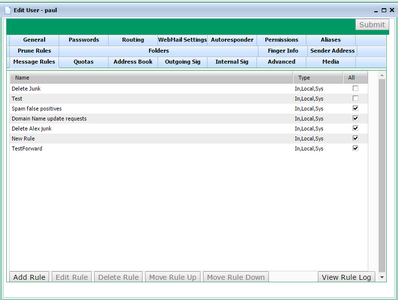 For instance, you could have one rule which checks for any one of a number of different subject texts, and then another rule which checks for a specific sender and also that the previous rule was matched. 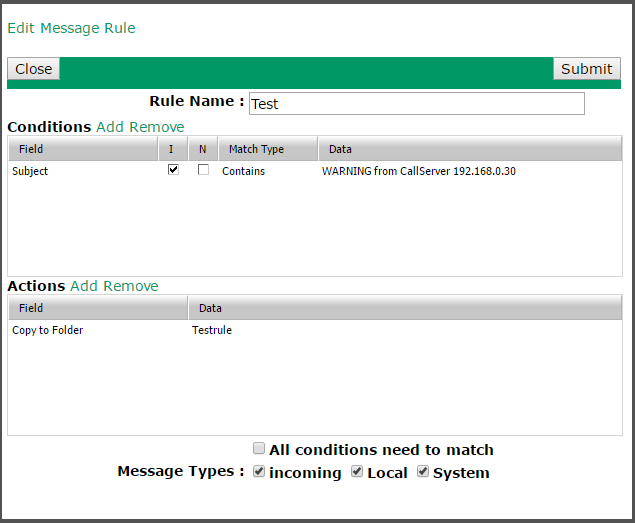 The Message Types boxes let you specify what type of message should be processed by this Message Rule. The options are Incoming (from an external sender), Local (from a local sender), or System (from VPOP3 itself - e.g. error messages). •Case insensitive flag - if this is checked then any text comparison is case insensitive. If it is not checked, then comparisons are case sensitive. The Field to check for is either an email header field (you can type anything you wish) or one of the offered options. If you want to specify a header field manually, then you can tell VPOP3 to look in multiple fields by separating them with commas, for instance "to,cc" will tell VPOP3 to perform the test in both the to and cc header fields. If either matches then the condition matches. The Match Type indicates how the message data should be compared to the Data to check for. For instance, greater than, or contains etc. VPOP3 performs all the specified actions. The order is irrelevant. •Stop processing after this rule - VPOP3 will perform all the specified actions then not perform any more Message Rule checks. •Mark Read - the message will be marked as read. •Add Keyword - add the specified IMAP4 keyword to the message. How this is displayed in your email client will depend on the email client you are using, and how it handles IMAP4 keywords. •Modify Headers - use the specified header modifier (eg "MyHeader: blob" will add a header called 'MyHeader' with data 'blob' into the message header). This might be useful for email client filtering later.